This practical handbook for homes and church communities helps to enrich the Christian celebration of Advent through the creation and use of an Advent calendar. Written for people of all skill levels, Baumgarten provides instructions for a calendar made of paper or junk mail, a no-sew felt version, and a fabric version for more advanced sewers.Teach Us To Number Our Days, however, is more than a simple crafts' book. Baumgarten provides readers with a brief history of the development of Advent in the Christian calendar, as well as detailed explanations of the various Christian symbols that can be used during the season. Paying attention to both the Old and New Testament symbols, as well as the Sundays of Advent and the Great 'O' Antiphons from December 17-23, this book is a complete guide to Advent for individuals, families, and churches. About "Teach Us to Number Our Days"
Barbara Dee Baumgarten is an artist and author who enjoys exploring the relationship between art and theology. She holds a Ph.D. in Theology and the Arts, and designs and makes vestments and banners for others. 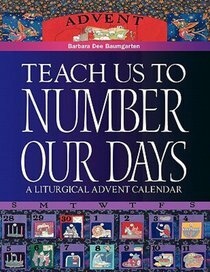 She is also author of Teach Us to Number Our Days: A Liturgical Advent Calendar. She lives in Kalispell, Montana.